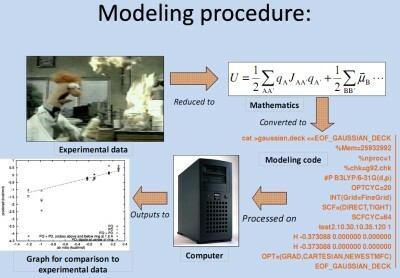 A comical-yet-serious flow chart depicting the methodology of quantum mechanical / molecular mechanical computation research and how it builds upon, complements, and leads traditional wet lab experimentation. A quantum mechanical / molecular mechanical computer was developed for the Saint Francis University Chemistry Department. Ab initio research was performed using the system to simulate the molecular dynamics on a specific variation of α-conotoxin GI and study its mispairing, unfolding disulfid bridge regioisomers. The research has positive implications for human health. Whitepaper: Computational Chemistry, Research, & the Computer: Preparing a Computer for Quantum Mechanical – Molecular Mechanical Simulations. Link to presentation slides (SWF).